GATLINBURG, TN - Great Smoky Mountains National Park is celebrating 20 years of conducting biodiversity inventories. 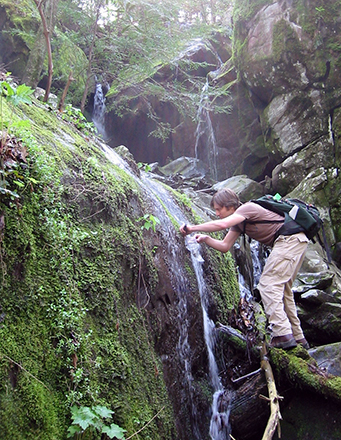 Park managers, biologists, educators, and non-park scientists initiated an effort to discover all life in the Smokies through an All Taxa Biodiversity Inventory (ATBI) on Earth Day in 1998. The non-profit partner Discover Life in America (DLIA), created in 1998, coordinates the inventory. Over the last 20 years, biologists have not only documented thousands of plants and animals, but have also identified nearly 1,000 new species previously unknown to science. The Smokies have a long history of research, and prior to the ATBI, about 10,000 species were documented in the park. That number is now nearly doubled, and some of the more surprising new records include species of well-studied groups like mammals and vascular plants. Some of the new species to science found during the ATBI include 31 moths, 41 spiders, 78 algae, 64 beetles, 29 crustaceans, 58 fungi, 21 bees and their relatives, 18 tardigrades (known as waterbears), and 270 bacteria! With collection records from every corner of the park, managers now have a much better understanding of what species exist and what environmental conditions they require. Through the years, the park and DLIA have hosted over 1,000 researchers from 150 different universities, museums, and institutions in the US and around the world. Numerous ATBI-related education events and workshops have been held since 1998, involving over 200,000 students and 6,500 teachers. Over 1,000 volunteers have been trained by DLIA in citizen science workshops and have contributed over 60,000 volunteer hours toward this project. In addition to the park and DLIA, the Friends of the Smokies and Great Smoky Mountains Association have significantly contributed to this ATBI through financial support. The Appalachian Mountains are among the oldest mountains in the world. Through the eons, forces such as wind, rain, freezing, and thawing eroded the peaks. Although glaciers did not reach this far south, their influence on the climate combined with the range of elevations and the southwest to northeast orientation of these mountains accounts for the striking variety of living things found in the park. The biological diversity of the Smokies was the impetus for conducting the ATBI, and the project has now grown to be the largest sustained natural history inventory in the United States. This scientific effort has produced a baseline for one of the most diverse ecosystems in the United States. Park managers now have a better understanding of the resources, and can better predict how changing conditions in the future may impact them. ATBI information also provides a foundation allowing for future park managers to make better-informed decisions. For more information about special events celebrating the 20th anniversary year of the All Taxa Biodiversity Inventory, please visit DLIA’s website at dlia.org.